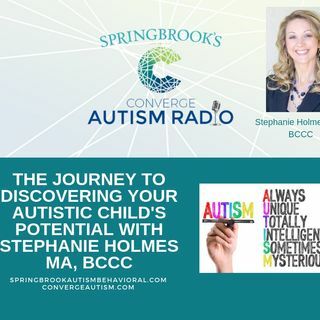 Join one of the speakers at Springbrook Autism Behavioral Health's yearly summit: Converge Autism, Stephanie Holmes MA, BCCC, and Certified Autism Specialist as she discusses the journey of finding a child's potential when they have autism spectrum disorder. She and host, Melanie Vann, MA and Life Coach from MHNR Network both have children on the spectrum, so their knowledge is first hand. Discovering your child or loved ones potential can be a trying one, but it can also be one ... See More filled with magic and joy. Every child or adult on the spectrum has something to offer. By tapping into one special task done well, a child on the spectrum can find confidence to master other areas of their lives. Don't ever give up hope; you can help your child find their way in the world; even if it often looks a lot different than everyone else's! Springbrook Behavioral Health, the creators of Converge Autism Radio, have numerous resources on their website including blog articles that they will often discuss on their show!